Come dancing with JAAM 28: Dance dance dance. This latest issue, edited by JAAM’s managing editors Clare Needham and Helen Rickerby, showcases writing about dance, writing that dances and writing by dancers. The editors were delighted at how contributors interpreted the theme laterally as well as literally. Some work is about dance or features dance, other work dances on the page, or sets up dance rhythms. Many of the short stories, including those by Michele Powles, Nina Seja and Andrei Baltakmens, often use dancing as symbolic of life or living more fully. There are dances on stage, at weddings, A & P shows and all alone in the back yard. Mikaela Nyman’s ‘The Obituary’ features dance as a form of language in the arctic, a language becoming extinct. As well as the dance of life, some poets have taken up the dance of death, such as Jennifer Compton’s ‘Moxham Ave’, featuring a bicycle accident, and Kerry Popplewell’s ‘Last dance’, which imagines a dance with the grim reaper that she’d rather sit out. 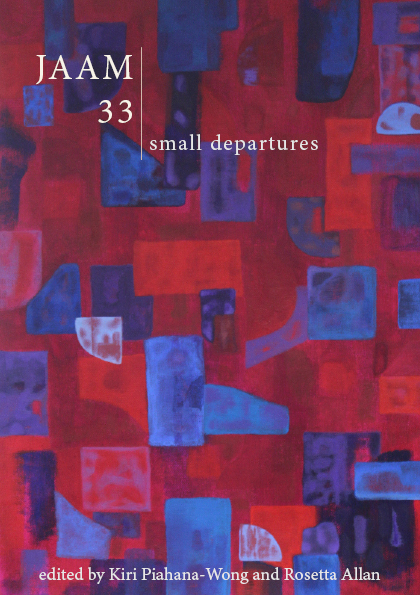 In Vana Manasiadis’s and Emma Barnes’s poems people dance gingerly in their relationships with each other, and also, like David Eggleton and others, create dancing rhythms. In other poems, such as those by Alex Taylor, the placement of the words makes them dance across the page. Many poets are clearly inspired by dance and dancers; Hera Bird’s three poems are from a series on Swan Lake, while Kate Bariletti’s inspiration comes from contemporary New Zealand choreographer Raewyn Hill. Barbara Strang references Anna Pavlova, while Jo Thorpe skips off with Marie Taglioni. Take a quick turn around the floor with dancer/choreographer/writers Michele Powles, Linda Ashley, Lyne Pringle and Sam Trubridge, who, in short ‘spotlight’ interviews, share their discoveries of how dance and writing have and haven’t worked together. In her non-fiction piece Time (Step) Capsule, Jackie Davis Martin reflects on the importance of dance in many stages of her life. 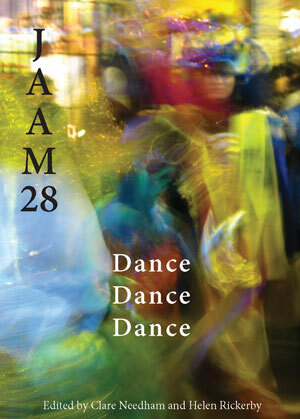 Six photographs by Kesha Robertson capture the vibrancy and movement of dance in South America – her striking swirling image of a night parade in Bolivia is also reproduced to great effect on JAAM’s cover. Dance designer Sam Trubridge’s drawings – hieroglyphs to communicate with dancers – also show how movement can be captured in a static image. This genre-crossing volume closes, appropriately, with extracts from a dance writing project by dancer Alys Longley. While the dances themselves can’t be represented in a journal, the poems and texts inspired by them are reproduced, complete with drawings, annotations and crinkles in the paper. This entry was posted on Thursday, November 18th, 2010 at 9:49 am	and posted in JAAM 28. You can follow any responses to this entry through the RSS 2.0 feed. My poems did not get accepted? I’ve telling friends for months about this acceptance and possible payment. Damn. Hi Nicole, yes your poems are definitely in there! It’s on its way to you, but postage from NZ takes a wee while. Maybe a couple of weeks? I did send it airmail though, so shouldn’t be ages.